She was elected Judge of the Constitutional Court the 22 November 2016. She has been member of the Constitutional Court since 1 December 2016. 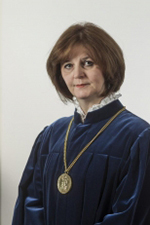 She graduated from the Faculty of Law of the Eötvös Loránd University in 1987. She started to work at a district court of Budapest, after the bar exam she became a judge, judging over a wide scale of family law, property law and contract law cases. After having spent one year in Belgium, she worked for the Ministry of Justice, dealing with the euro-atlantic integration, public law and constitutional law. She studied French law and administration at the École National d’Administration in Paris. Later she became judge at the Curia where she judged over the legality of State actions. She was member and secretary of the Association of Expert Judges on European Law and member of the Association of Administrative Law Judges.